Head down to the Granville Island arts and market district in Vancouver, Canada, and on any given day you're likely to hear a gentle groove rising above the bustle of artisans, tourists, shops and street performers. You'll first spot Jim Meyer's cap (did I mention he's pretty tall), then the headstock of his Stick, then the backs of all the heads paused to listen to his dulcet tones, for many their first encounter with The Stick, but for some a return visit, in search of Jim's new solo CD, Watercolour, a chance to bring those sounds back home. Jim Meyer was the featured Stickist on Free Hands Friday, June 27, 2014. Jim is a soft-spoken guy, and his music underlays a laid-back confidence with a tasteful undercurrent of technically ambitious arrangements and soloing. His rapport with the crowd is easy-going, as he introduces his original compositions, or tells the crowd, "This is one of my favorite Stick pieces by one of my favorite Stick players." Jim is one of a growing number of players tapping into the growing catalogue of compositions by Stickists to supplement his repertoir of original music and more familiar tunes. He's the sort of goodwill ambassador for a whole community of musicians that makes a lasting impression. Since attending his first Stick seminar in Vancouver in 1996, Jim has been to more of these events as a student, organizer, and now teacher, than almost anyone around. Starting in 2002 he's organized fourteen seminars, including retreats to remote Gabriola and Salt Spring Islands off Canada's west coast, and in Vancouver proper. For the past several years Jim has also been teaching at these events, alongside players like Bob Culbertson, Don Schiff, Tom Griesgraber, Jim Lampi, Dale Ladouceur and Greg Howard. Like many Stick players, Jim started out as a bass player, and initially approached the Stick as a bass-plus-guitar instrument. But it wasn't until he made the connection with the Stick's keyboard similarities that the instrument really clicked. Since that time he's written dozens of original tunes and recorded two CDs, his new solo Watercolour following 2009's Arbutus and Jade, an original instrumental rock album built around a Stick and drum duo. He's traveled to Stick events all around North America and Europe, embracing the seminar experience as an ongoing learning process while honing his chops through his daily busking performances, sometimes under pretty challenging weather conditions, it's not uncommon to see him wearing gloves with cutoff fingertips and serious outerwear (this is the Pacific Nothwest after all...). 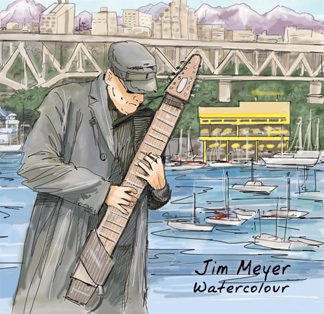 Jim's new solo CD for 2015 is Watercolour. It includes nine original compositions and three covers of songs by Tom Griesgraber, Glenn Poorman and Ron Baggerman. Now available from Stick Enterprises on CD. 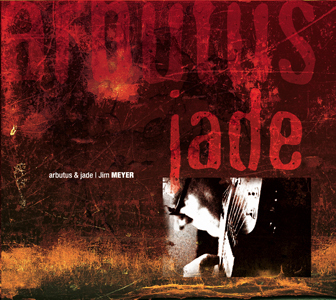 Jim's 2009 Arbutus and Jade CD is an instumental rock album, featuring drummer Mike Michalkow, and a special guest appearance by Don Schiff.